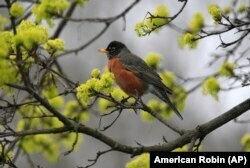 There are thousands of different kinds of birds. They come in all sizes and colors. And they each make their own sound. That was a robin singing. And this is the song of a canary. 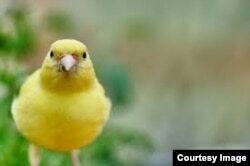 Canaries are active, cheerful birds. And they are known for their ability to sing. 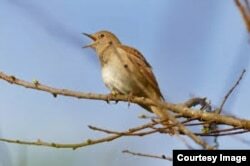 Some animal experts say they are among the best singing birds. You can even train a young canary to sing. And they can sing for hours! So, if someone says that you sing like a canary, you would think that they mean you sing cheerfully all day long! But that is not what singing like a canary means. Not even a little. In English, if you sing like a canary, you are reporting on someone to high-level officials, like the police. Let’s say police officers question someone suspected of a crime. The officers offer the woman a deal -- a lighter prison sentence in exchange for her cooperation. Wanting to avoid jail time, she sings like a canary and provides details about the people who helped her carry out the crime. In fact, even after the police have enough evidence, she keeps on talking, telling them about other crimes. She is like a canary that cannot stop singing! In this case, you could also say that she snitched or ratted on her criminal friends. If I snitch or rat on someone, I can also simply say that I have told on them. To tell on a person is to tell someone else a bad thing they have done. So, for example, if I tell on you, I share something bad you have done with someone else. Although, to tell on someone sounds a little childish. Brothers and sisters often tell on each other to their parents. Classmates can tell on each other to their teachers. Well, yes, they are. But that is not the point. To say someone “sang like a canary” simply states what the bird does naturally and often. It sings! The expression does not mean that the birds are bad. Also it does not liken them to criminals. So, if someone sings like a canary and rats on their friends, we would never call them a “canary.” But, we could call them a rat. Canaries, it seems, are easier to love than rats. 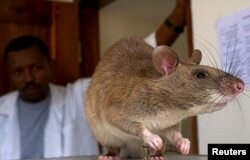 This is an African Giant Pouch Rat. While they may not be loved, this rat is being trained to find disesases. There is an important thing to note when using these expressions. When we use “sing like a canary,” most often the person doing the singing is also guilty themselves. However, if you snitch or rat on someone, you do not necessarily have to be involved in whatever it is you are snitching or ratting about. But when you use sing like a canary, you usually have had a hand in the trouble. Unlike the cheerful canary. It just wants to sing. And that’s Words and Their Stories! I’m Anna Matteo.